Not only known for its laid back and artsy ambiance, Ubud is also comprised of healthy organic food markets. This time, Stephanie Brookes explores the Saturday Ubud Organic Market scene. Seeking out farmers’ markets in Ubud can be a lot of fun. I was on a mission to find extra virgin cold pressed coconut oil but I found a whole lot more at the local Saturday Ubud Organic Market right in the centre of town, which is set up outside Pizza Bagus, a famous eatery. He continues speaking with a smile. “I sell out my stock every week. Because our process is natural, once you open a bottle of organic coconut oil, you have four weeks to use it. This makes for a good turnaround and lots of repeat clients,” he said, handing me a bottle to inspect. Made also had a selection of teas from his village, but not ordinary black tea. Made’s teas are made from wood, flowers and the root of turmeric and ginger. I picked my way through the delightful assortment of dried, old bits of stalks and leaves, many of which I did not recognize, and settled on a flower tea I was familiar with, Rosella. It is a medicinal tea renowned for its remarkable vitamin C content. I moved on to the vegetable stand, which had piles of organic vegetables including red and yellow peppers, cabbage, eggplant, potatoes, carrots, bright crimson-red dragon fruit and fresh looking knobs of ginger. I discovered after looking around that you must check each stall, as only some sell certified organic food and others are selling farmers’ fresh produce. I met Putu, one of the vegetable sellers, who is from Pejeng Village just five kilometres away. She told me she had been selling at the Ubud Organic Market for nine years. Next, I met the coffee lady who sold organic coffee from Karangasem. After launching into a lengthy story about coffee cultivation, picking and roasting, she was keen for me to try her latest creation – coffee with cinnamon, ginger and cardamom. It was a delicious coffee version of chai masala. What a winner! 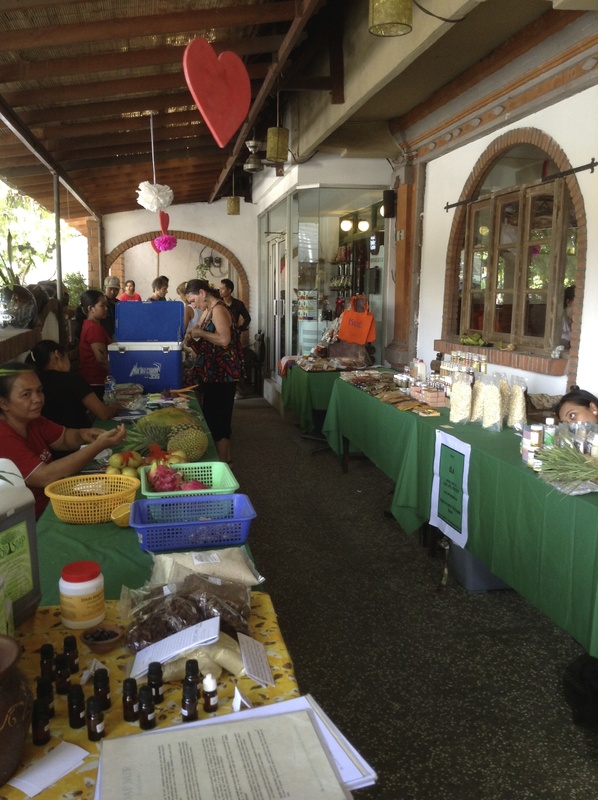 The Ubud Organic Market operates once a week, on Saturdays. It is comprised of 16 sellers and the range of products you can buy here includes vegetables, jams, soy milk, nuts and seeds, packaged flours, oil, artisan bread, seedlings, soap nuts, chemical-free household cleaning products and natural beauty products. This collective of farmers and growers has been serving the Ubud community since 2006. 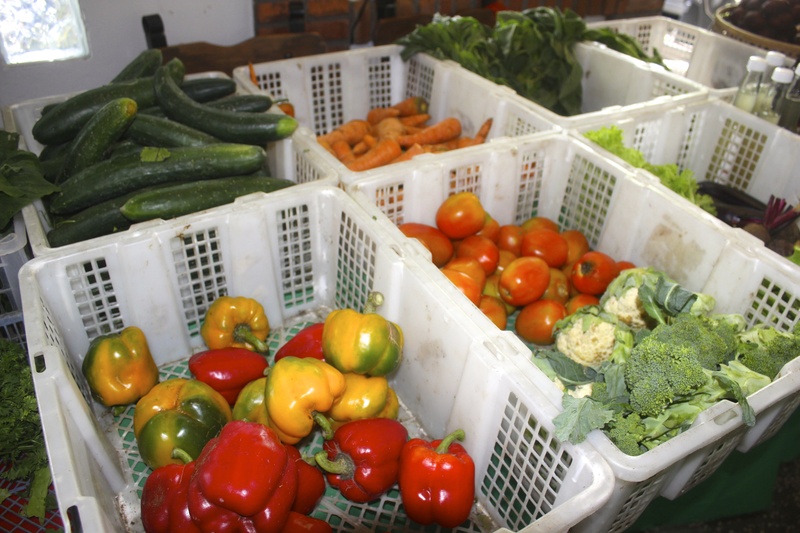 The prices are virtually wholesale, as these independent farmers sell directly to the public without the middleman. The markets also serve as a meeting point for a good catch up with old friends or a place to make new friends and trade information. Ubud has a growing number of health conscious locals, expats and visitors, now with over 700 restaurants and bars. Many of the restaurants are plant-based vegan, vegetarian and raw food, plus there are several cooking schools. Well known for its health retreats, yoga centres, ashrams and spiritual learning centres, organic eating choices abound. Every second or third eatery seems to be a fresh juice bar, a vegan warung, a vegetarian eatery, a gluten-free café or a raw food eatery. I was impressed that every stall makes an effort to provide information sheets (in English) and all of the vendors are very keen on sharing fun facts about their products. Customers can also gain more insights about the products on their website. On the way out, I just had to grab some local organic peanuts, red rice, Chia seeds (which grow well in Bali) and local cacao before hitting the imported rows of organic quinoa, flax seeds and almonds. These market sellers have every angle covered and know what the health food buyer is seeking. The prices won’t leave a dent in your pocket, so check out the Ubud Organic Market when you are next in Bali and try some of the local delicacies. Additionally, here is a shortlist of other great farmers’ markets to check out in Ubud. This new farmers’ market offers mid-week shopping offering fresh produce, a range of organic items and health food.